Mrs. Hufnagel is gone but not forgotten as Elliott meets with her lawyer, who is settling her estate. Axelrod's (Stephen Furst) size 10EEE wingtips. The nineteenth installment in the saga of Mrs. Hufnagel (Florence Halop), the late doctor-tormentor extraordinaire, is much shorter than the previous two installments, but even though the sickly old woman has left the corporeal realm, she still manages to impose on the staff of St. Eligius. 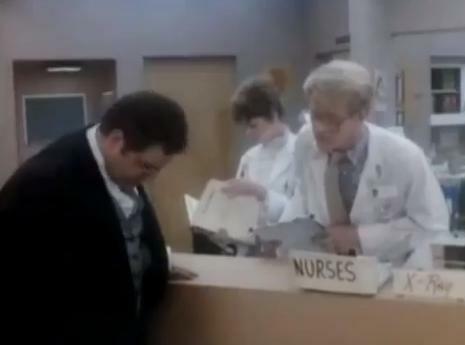 Dr. Elliott Axelrod (Stephen Furst) is dressed in a suit, which the wise-cracking Dr. Victor Ehrlich (Ed Begley, Jr.) comments upon by asking "who died?" "Mrs. Hufnagel," Elliott deadpans, explaining that the lawyer handling the late patient's estate asked to meet him that night. Elliott is expecting to have been willed something, to which Victor warns, "Whatever it is, you don't want it. The old bat didn't own anything, a ham radio, a couple of gerbils, maybe..." But the goodhearted Axelrod still thinks it pays to be nice to patients. Elliott meets with Bradford Norton (Michael Fox), senior partner of the law firm Norton & Inch, which had represented the family since Goody Gluck's first Salem Witch trial. It turns out the only beneficiaries named in Mrs. Hufnagel's will were Elliott and a reptile park. 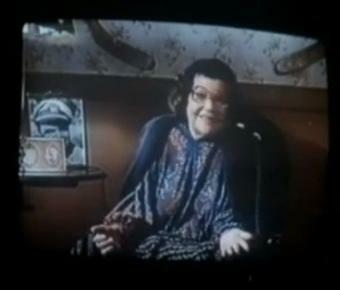 Mrs. Hufnagel, ever the early adopter of technology, recorded a video will, enabling Florence Halop to make one final appearance on the show. Never one to miss the opportunity to cut someone down, she acknowledges that it must have been hard for Elliott to make friends with "that Mack truck tire around your waist." In a classic comedy device, she accuses Elliott of having a schoolboy crush on her, and when he protests that he didn't, she correctly predicts on video that he would complain, and responds from the beyond "You did, too! Shut up, chubs." But she liked that he cared about her, and that he cried on her shoulder when Murray died. She leaves him with the Gluck family creed--"It is better to be despised than forgotten." Then they get down to business--her estate was worth $250,000. Elliott gets everything left after $75,000 goes to Earl's Reptile Park, and they deduct medical bills, mortgage costs, gambling debts, helicopter rentals ("Florence was quite an aviatrix"), state and federal inheritance taxes, and legal fees resulting from "a regrettably undecided lawsuit against American Samoa." That leaves $137.65 for Elliott, which should be enough to cover the boat rental and a breakfast special, as he has been entrusted with disposing of her ashes at sea. I've left in the final shot which includes a glimpse at the relationship between Dr. Jack Morrison (David Morse) and his college-student girlfriend Clancy Williams (Helen Hunt), who has been reduced to being his babysitter now that Jack has to redo med school on top of his duties as a resident. The argument that erupts in this scene leads to the end of their relationship. I love St. Elsewhere's long, continuous shots that would flow into the next scene. The Salem Witch Trials took place in 1692. It has been established that Gluck family (Hufnagel is her married name) came to America shortly after the Mayflower, which made the passage in 1620. Goody would have been lucky to have legal representation, as most accused were not afforded the opportunity. The Trials forced the legal system in the new colony to tighten up its game, like not allowing testimony involving specters as evidence, requiring proof and not just hearsay, etc. I didn't recognize him at first, but I am familiar with veteran character actor Michael Fox (1921-1996) from his role as Saul Feinberg on the soap The Bold and the Beautiful in the nineties. Fox was the one who forced Family Ties/Back to the Future/Spin City star Michael J. Fox to use his middle initial in his stage name. The Gluck family creed is a personal favorite line of St. Elsewhere writer Channing Gibson.